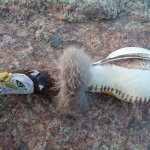 By the artist "Moon Cat", the Eagle Feather Rattle embodies the energy and medicine of the Eagle. Eagle medicine teaches us the balance between Earth and Sky; Wind and Water. The Eagle soars with the cloud nations, and dives into the depths of the sea, so to with the Eagle medicine, you will learn to navigate between the Spiritual World and the Natural World. This Rattle is made from rawhide and contains organic corn, selenite and clear quartz crystal within it. 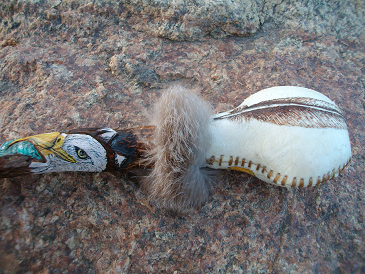 It also has an Eagle hand carved into the handle of it, and rabbit fur around the top of the handle.